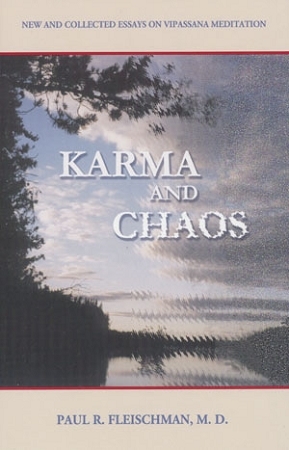 Author and psychiatrist Paul Fleischman explores the interface between psychiatry, science and the timeless teaching of the Buddha in Karma and Chaos. Eight new and collected essays by Dr. Fleischman in this thoughtful work probe the heart of the Buddha's legacy to humanity: self-correction through meditation. Drawing on his many years of practice as a therapist, and as meditation student and teacher, he guides us with authority and humility into the essence of Vipassana meditation as taught by S.N. Goenka, its psychological benefits and perils, and the inextricable foundation of moral actions. If the Buddha returned to scan the English-speaking world for a spokesperson with the psychological range of an eminent psychiatrist, the descriptive powers of a poet and meditative experience, his eye would certainly fall upon Paul Fleischman. Karma and Chaos probes the very heart of the Buddha's legacy to humanity--self-correction through meditation--and in a language as beautifully precise as it is free of jargon. This is a superb little book, a mature and beautiful flower from one of the past century's truly important developments: the reseeding of the Buddha's ancient teaching in a western and global context.